Potatoes are sometimes called "food poor" .. but this does not mean that they themselves were poor, quite the contrary .. Potatoes are a cheap and also a rich source of vital and essential substances for our health .. Potatoes came from the Incas, from which the Spaniards acquired for Europe, but originally as an exotic flower. Only in the 18th century potatoes reached Europe in importance as a food and farm produce and for us, their cultivation spread in the 19th century. Due to the relative ease of the cultivation and high nutritional value of potatoes to quickly gained great popularity and proved zasytit all layers of the population, including the poor. Apples contain a wide variety of trace elements such as potassium, magnesium, zinc, calcium, phosphorus, iron, copper, fluorine, sodium, chromium and others. They are therefore an excellent and inexpensive source of minerals essential for the health of our bodies and their correct operation. Critical for heart and vascular system, hormonal processes in the body fluid metabolism, hematopoiesis, healthy bones, joints, tendons and muscles, fertility and potency, ultimately, skin, hair, nails, body defenses and nerves. Potatoes are also healthy for the growth and development of children, all the above-mentioned minerals, especially calcium, magnesium and zinc are very beneficial for their growth, both bone and muscle tissue, as well as mental development and a strong immune system. The vitamins found in potatoes, especially vitamin C, which, although partially destroyed by heat treatment, but still worth mentioning. Peel potatoes also contains B vitamins such as niacin, pantothenic acid, and very beneficial folic acid, which plays such an important role in hematopoiesis, for fertility and healthy development of the fetus during pregnancy. The high potassium content of potatoes has a positive effect on our cardiovascular system. Regular consumption of potatoes to help maintain a strong and healthy heart and vascular system, even so, we can help to treat high blood pressure. If you suffer from high cholesterol levels in the blood, we should avoid a diet rich in animal fats, potatoes and just its rich nutritional composition with a relatively high content of vegetable proteins are foods that we should include in our diet. If you suffer from excessive swelling and water retention in the body, potatoes can help eliminate these problems. Potassium and sodium in potatoes good for proper metabolism and stimulates fluid drainage and kidney function. Potatoes are known for their relatively low caloric value, contain almost no fat, yet they are rich in nutrients for our body energy source. When reducing diet is suitable to put potatoes in a reasonable amount into your diet, give us vitamins and minerals and many plant protein, one serving potatoes can cover almost the entire recommended daily dose of essential amino acids. While serving potatoes (about 150g) has only about 130 calories. How to properly process the potatoes in the kitchen? When cooking potatoes neloupejte when you do not .. a lot of minerals and vitamins in potatoes was hiding just under the skin. It is better to wash the potatoes well and cook full blast, then exfoliate or peel with consumerism as well, if quality. The best peeling potatoes using a scraper, offering cuts from tubers that the thinnest layer of skin. Perfectly remove potato sprouts before heat treatment .. contain toxic substances toxic to the human body, which is decomposed by heat treatment. Much prefer sprouted potatoes do not consume at all. 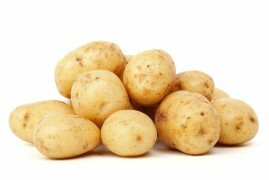 Boil the potatoes in a small amount of water .. so there is a minimal run-off of nutrients. When you cook potatoes without skin, you can then use the water as a fused into the soup, there's still plenty of nutrients usable by the body.